What could Tim Burton have possibly seen in Big Eyes, the story of a monotonous, marginally talented, yet enormously successful “artist?” Something of himself, perhaps? For years, even Burton’s staunchest detractors (I’m one of them) have conceded him two masterworks: Pee-Wee’s Big Adventure, which owed much of its goofy appeal to Paul Reubens’s manic creation, and Ed Wood, hands down the director’s most mature, fully realized creation due in large part to the lead performances and a compassionately caustic screenplay by Scott Alexander and Larry Karaszewski. Imagine the delight when news arrived that the duo — they tend to vacillate between Oscar bait (Ed Wood, The People vs. Larry Flynt) and risible kidpics (Problem Child 1–3, Agent Cody Banks) — would once again be around to try and help make Burton look good. Lightning failed to strike twice. 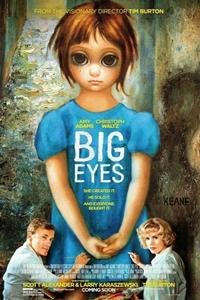 The finished product is another one of the director’s triumphs of production design over storytelling, as structurally spiritless as the ocular-enhanced, Children of the Damned urchins generally associated with the paintings Walter Keane (Christoph Waltz) appropriated from his wife, Margaret (Amy Adams), and passed off as his own creation. Johnny Depp portrayed Ed Wood as a blithe nimrod hoping to hitch his star to a more talented, albeit on-the-skids Bela Lugosi. Waltz, badly miscast, adopts a similar approach adding an exasperating tinge of Broadway Danny Rose cloying condescension to every comment, inquiry, request, command, and exclamation he speaks. Adams, who spends most of the time looking shell-shocked, fares slightly better as the subjugated, trounced-upon lady of the house. Krysten Ritter pops up briefly, no doubt cast for her resemblance to Burton’s ex, Lisa Marie. Everything in the film — from the overlit endeavors to reproduce the look of ’50s Technicolor to a Beach Boys cover version — looks and feels artificial. Burton had a chance to make a powerful statement on the struggle for a woman to achieve artistic recognition and instead settled for another childlike fairy tale. Dec. 24, 2014 @ 5:57 p.m.
Scott, "Edward Scissorhands" was an interesting and strange movie, as was "Frankenweenie" and "Alice in Wonderland." I don't think you will ever see Tim Burton making powerful statements supporting mainstream politically correct topics. Burton just sees the world differently. Making a film about the artist who created those weird kitschy paintings instead of the woman featured in "Tracks" speaks volumes. I don't know about "Lisa Marie," but I heard on the radio that he's splitting with his 13-year-companion Helena Bonham Carter with whom he has a couple of kids. Dec. 24, 2014 @ 7:19 p.m. I thing "Ed Wood" is a very powerful film, an at times moving love story about two losers, one on the way up, the other on the way out. There is none of that depth of characterization here. Lisa Marie was a longtime girlfriend of Burton's and a dead-ringer for Ritter. Merry Christmas, Monaghan! Thanks for pitching in. Dec. 25, 2014 @ 5:32 a.m. If this movie does well, Burton will next direct a film on the life of Cassius Marcellus Coolidge (September 18, 1844 – January 13, 1934). He's the artist behind these masterpieces! Dec. 25, 2014 @ 6:37 a.m. Dogs Playing Poker, a classic and so ripe for a prequel. Were the dogs in the picture based on real dogs and what was their story? Dec. 25, 2014 @ 11:28 a.m.
Three of them ended up at the Betty Ford Center for gambling addiction. One of them, found later to be a cheater, won big at those canine poker tables and retired to Boca Raton, FL. And there was lots of X-rated stuff that would have to be left out of a Hollywood movie, even one by Tim Burton. Dec. 25, 2014 @ 6:55 p.m. I hope the movie stays true to the book, it was a tearjerker.